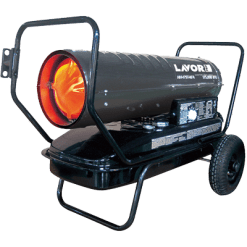 A workshop heater can also be called a portable diesel heater or shed heater mainly due to their size. It’s also called this because of the type of heat they produce as opposed to a radiant heater. In the “industry”, they are generally known as a forced air heater because that’s basically what they do. These types of diesel heater have a small tubular tunnel (like a torpedo). The units are equipped with a large fan down the back and a plate and burner up the front end. 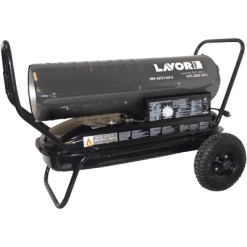 The diesel or kerosene fuels the burner, while the electricity is used for the ignitor and fan. When started, the burner is ignited, burns the fuel and pushes the flames forward (retarded by the plate). The fan then starts up and pushes that heat through the tube and out the front of the unit in a direct and/or “forced” manner. 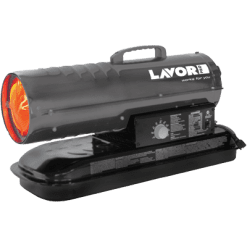 Lavorwash have 3 separate types of workshop heater. The heaters are rated according to BTU (British Thermal Unit) and Heating Area. Generally, the larger the BTU and heating area, the more expensive the running costs. Our range of heaters start at 70,000 BTU – 175,000 BTU.